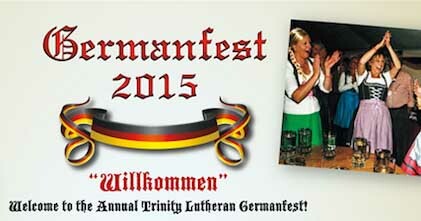 Willkommen/Welcome to the Annual Trinity Lutheran Germanfest in Traverse City. This Northern Michigan event celebrates German influence in Traverse City and promises to be a great day! Trinity Lutheran Church and School welcomes you to Germanfest, a celebration of northern Michigan’s German Lutheran heritage! Trinity Lutheran School offers academic excellence, with Christian values to all children currently from pre-K through 5th grade. It is hoped that Middle School grades will be returning in the near future. Our small classes produce HUGE academic and spiritual results! German families started arriving in northern Michigan in 1860, and in 1869 they established the first Lutheran Church in Leland. Today, there are eight Lutheran churches in the Grand Traverse area: Immanuel in Leland, Our Savior in Benzonia, St Paul in Good Harbor, Grace in Elk Rapids, Bethlehem in Glen Arbor, Redeemer in Interlochen, St Michael in Traverse City, and Trinity in Traverse City, all with deep German heritage. All are welcome to attend. So, it’s time to put on your Lederhosen and Dirndl, and experience the taste and feel of Germany right here in Traverse City. Join us for authentic food, fun, and celebrate our German heritage. You will be treated to traditional foods, which will include Bratwurst, Sauerkraut, and Knackwurst, German Potato Salad, Cucumber Salad, Spatzle, Sauerbraten, and don’t forget to leave room for the desserts! The beer, of course it’s imported! It’s from the famous Hofbräuhaus in Munich, and the wine is from the Rhein and Mosel valleys. There will be dancing and singing to traditional music from Tommy Schober and the Sound of Sorgenbrecher. It will all take place on a spacious wooden dance floor under the “Big Top Tent”! Tickets to Germanfest are $40 per person Entry begins at 6 pm. Admission price includes the buffet style dinner and the evening of live entertainment. Reserved group seating is available for 8 or more guests. No-Dinner admission ticket is available at $25 per person; entry begins at 8:00PM. Admission will be strictly limited to 600 adults (21 and older). They are expected to sell out quickly. Beer and wine is sold separately at $8 per token, and are limited to 4 tokens per person. Proceeds will help Trinity Lutheran Church and School to further Christian education. Vielen Dank for showing an interest in Trinity Lutheran’s Annual Germanfest! Find more Northern Michigan events on the MyNorth community calendar!